This to me sounds like a fictionalised account of the Barney case – with a touch of Rattigan’s After The Dance thrown in. I’d love to see a copy and would also like to know if the Princess was writing from direct experience or merely from hearsay. Pearson admits that it is difficult to find out who Troubetzkoy actually was. This is true. Unlikely as it seems, there were a number of Prince Troubetzkoys kicking around London and up to three that went by the name of Princess Paul. However, I think the author of Half O’clock in Mayfair was born Rhoda Muriel Boddam in Suffolk in 1898. She was the daughter of a retired Indian Army officer and his much younger wife. She married James G.H. Somervell in 1917, but this seems not to have lasted. James, whose father owned and then lost, through bankruptcy, Sorn Castle in Ayrshire, then spent much of the 1920’s travelling to places like Ceylon and Argentina as a Political Agent. His address throughout the period is given as the Carlton Club. Like several other young divorcees, some of whom hover around the Barney case, Rhoda, now apparently calling herself “Marie”, tried her luck on the stage. 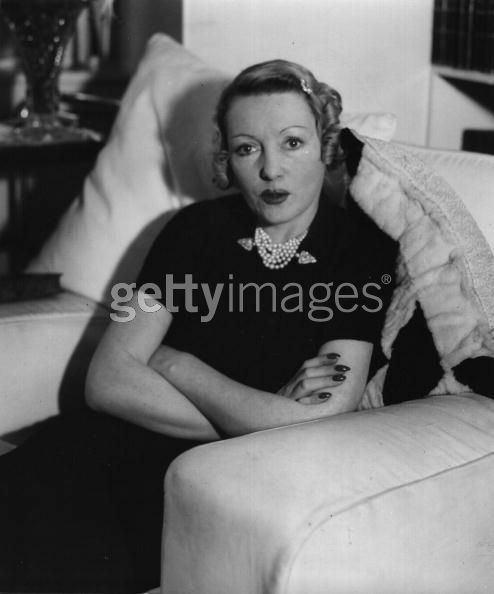 Using the stage name Gay Desmond, she was a chorine in Andre Charlot’s revues at the Alhambra (acting alongside Sunday Wilshin, Anna Neagle and, I suspect, a few of Elvira’s friends). Charlot was an important impresario and from 1915 to 1935, mixing ballet and Broadway, brought a touch of Parisian glamour to the London stage. His shows depended heavily on beautiful female performers and many a career started at the Alhambra. In 1931, Rhoda M.M. Somervell married the elderly Russian artist, Prince Paul Troubetzkoy. She then (if we have the right princess) took up a career as a writer, producing a number of novels between 1933 and 1943. Apart from Half O’Clock in Mayfair, the most intriguing is a dystopian fantasy Exodus A.D. (1934), written in collaboration with the English Futurist, War artist (and friend of Ezra Pound and Wyndham Lewis), C.R.W. Nevinson. The Troubetzkoys lived in the heart of fashionable London, at a very exclusive address – 53 St.James Square. The Prince died in 1938 and Marie, as she now was, spent her time between a Park Lane flat and a residence at Iver, near Pinewood Studios in Buckinghamshire. Until the war, she travelled frequently to the continent and particularly France. The Castiglione Bar in Paris, where she sold her her roman a clef to Kahane, was a favourite with English and American aesthetes and artists (including Olivia Wyndham’s friend, Carl Van Vechten). The fact that an already published author turned to Kahane suggests that the book might have been too racy or too libellous for an English publisher – and also that it may have contained some inside information. Even though Elvira was dead by this time, there were others keen to distance themselves from their involvement with the Fast Set. The books dry up after 1943. Princess Paul died after a fall in her garden at Word Cottage, Iver in 1948. Her death seems a little suspicious but the inquest found nothing untoward. Although her novels appear to have been reasonably well received, they are all long out of print.She is genuinely a forgotten figure. So, assuming we have pieced together the right Princess Troubetzkoy, did she know Elvira? She is a little older than most of Elvira’s set , her artistic circle belongs to a slightly earlier generation and she is very much Mayfair rather than Chelsea.Nonetheless, these circles overlapped and she is around at the right time, in the right place, and has the right professions (actress then author). If she didn’t know Elvira, she would have known of her and known women not dissimilar to her. She would have followed the case with the same eager curiosity as the rest of Society. A proper examination of the novel would reveal more – has anyone a spare copy?